With the cost of heating your home with gas or oil constantly on the rise more and more people are looking for a viable alternative to help keep their family warm when the cold weather sets in. One such alternative is to move to a solid fuel boiler system this is where the Burrington from Mendip Stoves comes into play. 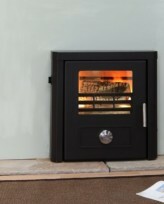 The Burrington is a highly efficient inset boiler stove running off smokeless fuels it provides a total of 13kw, with 2kW to your room and 11kW to your hot water system which is more than enough to provide heating and hot water to a small home. Running a system like this is often thought to be difficult and time consuming but the Burrington does its best to change that view with thermostatic controls, easy reload thanks to the cool touch handle and large ash pan for cleaning your stove can run for up to 8 hours on a single reload, and with its air wash system you will always have a brilliant view of the fire to help you feel that little bit more at home.